I apologize, but this post might be a bit long. It worked extremely well, with a couple of long driving days, but the days were also long, and we were all so enchanted with both the Scottish folk and the scenery. I do wish we'd had a couple of extra days, but we were happy our adult daughters were able to spend that time with us. Now on to this year. My husband and I want to go in September, and we'd love input, as we're just starting to plan. We will fly Toronto - Glasgow and return, and are looking at flights for the second week of September, possibly the 11th to either the 28th or 30th. What do we like? Mountains and moors and glens, ruined or semi ruined castles, bagpipes, marmalade with scotch in it and heather honey. Basically the main requirement is scenery that knocks our socks off, as we're pretty well flatlanders. We all adored Skye and had the good fortune to have no rain while there, and one spectacular day, sun all day, we liked the scenery from Callandar to Glen Coe and from Eilean Donan (castle meh) to where we picked up Loch Ness (Loch meh also), hills and trees. This is where I fall apart, we'd like to explore Wester Ross, and possibly the North East Coast as well, but I can't get a handle on how to plan this part. Would we hopscotch all along the coast, either ending or starting in Inverness, how many nights for this if we were able to take it slowly? Nothing is booked yet, so we're open to any and all suggestions and recommendations. Many thanks for taking the time to offer help. We're very excited about another fabulous Scotland trip. 4 nights would be great but honestly (and I really love Mull) three nights would be good. Then head out doing a loop north and west from Inverness, then down the Great Glen. Then to Mull, then Argyll and finish up at GLA to fly home. That's an interesting option. We always try to do our trips cost effectively. I could only find the train schedule to the end of July, cheapest £82 for two, and the car is about $25 per day, but it's definitely worth considering. Jet lag isn't too much of a concern. Last year we had 3 hour layover in LHR, then visited the Kelpies and ended the day in Callander. Not that we'd consider driving directly to Inverness! If we did opt to drive, perhaps counterclockwise, where would you suggest we stop the first nights? .>> and then fry to Inverness)<< oops not 'fry' . . . fly . . . If you want to drive I'd probably go via Pert or Dunkeld (Dunkeld is really lovely and only about 90 mins/2 hours from GLA. Then you could pretty much bypass Inverness and head up to maybe Dornoch. From Dornoch north to around Thurso, then to the west through Lochinver and Ullapool, then down the Great Glen to Mull/Argyll. This would be a pretty full 2+ weeks but totally doable. To allow for more multi night stops me personally, I'd probably cut across west from Dornoch towards Lochinver and cut off the very northern bits. So one night in Dunkeld on to Dornoch, for one night? Across A837 to Lochinver? Is that a scenic route? Is there any point in cutting off the extreme north east, and going through Tongue and Durness on the way to Lochinver? And would you recommend staying in Lochinvar or Ullapool, or somewhere else? How many nights? I'd stay 2 nights in Dornoch -- it will take a while to get there and ther is quite a bit you can see in the general area. I'd probably stay in Lochinver AND Poolewe or Gairloch. One night each or 1 night in Lochinver and 2 nights in Poolewe/Gairloch if you have the time. That would add a LOT of time -- like 2 full days at least. There is a lot to enjoy no matter which areas you explore, but me personally, I'd rather move a little slower and have time for 2 night stays. We are kind of in the same situation as you are, have been to Scotland a few times. We are going in June and I wanted to take advantage of Air Canada's daytime flight from Toronto to LHR. We are spending a few days in London and driving up through the Cotswolds, Yorkshire and the Lake District as we will be gone one month in total. After a few days in Edinburgh we are heading up, past the fishing villages (been before) and to Dunottar, staying in Stonehaven. Then we will wend our way through the Cairngorms. We are spending a night in Dornoch and then heading north and going over to Orkney for a couple of days. We will drive most of the North Coast 500 route, going to Lewis and back on our way. On our way back south we will stop in Gairloch, and somewhere near Ft. William. We take a detour to Arran and finish our vacation with a few days in The Dumfries Galloway area.. Flying home form Glasgow. Jane, our original plan was the Orkneys for a few days instead of Mull, but a few posts suggest the scenery is more spectacular in Argyll, and this trip is all about that. If we have extra days, at this point in our thinking, we'll head to Ayrshire. The Black Isle alone looks like it deserves a full day. We weren't able to see Cawdor Castle last May, and I'd like to fit that in too on the drive from Dunkeld to Dornoch. I have to look closer at a map, that might be too much for one day? 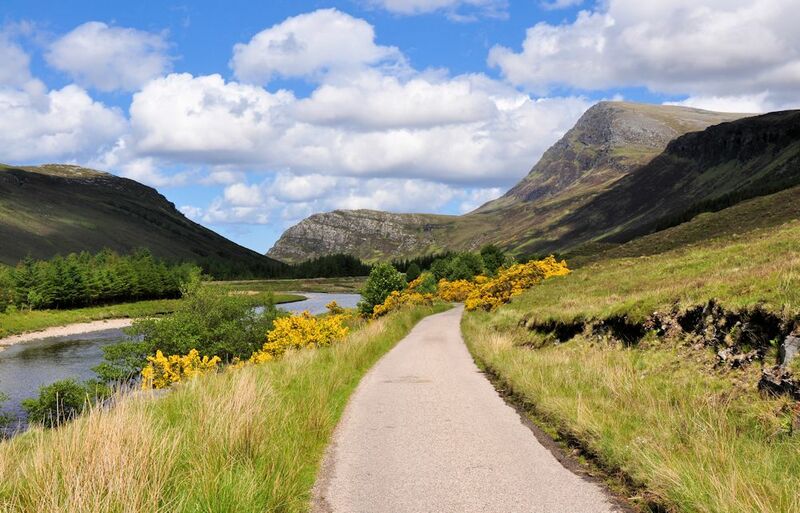 By cutting Mull and Argyll back to 3 or 4 nights total can you front load your itinerary giving you a night in Dunkeld, then on to Cawdor and stay a night either near there or on the Black Isle, and then on to Dornoch ? From say Gairlich to Mull should we stop one night somewhere? I'm asking because I was looking into Seaview and Staffa House on Mull, and Seaview only has three nights and Staffa one double room available. Open 5. D & G? Ayrshire? I'd consider stopping that night in Invergarry or Invermoriston? Or even in Plockton. I just booked our plane tickets, and we have 18 nights. Working from the basic plan, we have five nights to play with, and I'm struggling with options. Option 1 Do the whole coast north from Dornoch and around to Gairloch, and how many days for that? 2 - leave Mull for inverary on loch Fyne, drive kintyre to Campbeltown, how long, then what? 3 - maybe D&G, one or two locations. We were there about (gulp) 40 years ago and stayed in Kirkudbright, visited Threave Castle. If we don't need five nights for option one, combine one and two? We just need to keep in mind that the car has to be returned to Glasgow airport no later than 1:00 pm. Of those I'd probably do a combo of 2 and 3. 2 days for the Kintyre Peninsula, the a ferry across to Arran and a ferry across to the mainland. and 3 days in D&G . . . OR stay one night on Arran and two in D&G. This would give you entirely different types of scenery than you will have seen up in the NW. Thanks Janisj, I like that a lot. You've been such a great help. No doubt I'll be back for more specific advice! I'm coming to this thread pretty late and as usual Janis has done yeoperson (is that a word?) work so far. My comments are that Mull and Argyll and the northwest coast are just about my two fave places in all of the Highlands, and while, yes, they're pretty far apart in Scottish terms (not North American ones) I'd do my best to include a few days in both. With 18 days total you have plenty of time. And in accordance with my own tastes, I'm going to suggest some places that I happen to like a lot, even though some may disagree. If you wanted an easy first day but well positioned for the next day, the village of Luss on the bonny banks of Loch Lomond would be easy. Or if you're a little more energetic, you could motor on to the first of my recommended points, the village of Fortingall at the head of Glen Lyon. Fortingall is a tiny village with a terrific hotel and a bunch of (very unusual in Scotland) thatched buildings next to the ancient churchyard. The yew tree in the churchyard is reputed to be the oldest living thing in Britain, maybe in Europe. Pontius Pilate allegedly was born in Fortingall. But the star is Glen Lyon itself. In the autumn (if you're lucky enough to be there when the leaves are turning) the valley turns to gold, and there are times when the low clouds or fog that frequents the glen can open up a little and let some sunlight through, resulting in an ethereal incandescent world of glowing yellow and gold. Nothing short of amazing. This usually happens around sunset and it will mark you forever. Anyway, poetry aside, I'd then continue north on the A9 through Inverness (IMO worthy of filling the tank and that's about it) and up to the Struie Hill Road (B9176) which will take you up and over the hills to the inner part of the Dornoch Firth. Here's the view from the summit - http://gardyloo.us/wp-content/upload...130614_15s.jpg . Continue north and around Loch Eribol to Durness and visit Smoo Cave, then head south toward Ullapool. After Ullapool, continue south to Inverewe Gardens, then through Torridon and around Loch Carron to Plockton. From Oban, head south a half hour or so to Kilmartin. Kilmartin Glen is the home of the largest collection of prehistoric landmarks in Scotland. The floor of the glen is littered with standing stones and stone circles, burial cairns... and the little museum in the Kilmartin church has some marvelous carved Celtic grave slabs, under cover to arrest their decay. It's a tiny, beautiful and quite eerie place, marvelous in my mind. Like I said, I'm biased, but IMO this is a fabulous combination of places and sights, with a whole lotta history - stone age to jet age - thrown into the mix. Thanks so much for chiming in gardyloo. I had already discovered your micro trip report, absolutely haunting history and scenery, and its on the list. Last year we were on Skye. Back to my maps, and then I'll be back! I had really hoped you and janisj would help, as your advice and experience is phenomenal. I so appreciate how generous you both are with your time. Bookmarking. Thanks for all the info! if we want, is there time to go from Gairloch to Torridon around to Applecross and Bealach na Bo? If we choose not to do that, which of these is better: go down Glen Carron, Eilean Donen (not stopping there) to Invergarry, or back through Inverness down Loch Ness to invergarry? Day 8,9,10 Mull, trip to Iona if weather is good, I'm looking at Fionnhport. Four one nighters, four two nights, two three nighters. This is obviously a driving trip, but have we given ourselves enough time most days to stop here and there, get out of the car and maybe hike a bit or more likely gape at the scenery. Please give me an honest critique. Should I add somewhere or take away somewhere? When we started this, I thought 18 nights was generous, but it's not enough! I might stay only one night in Ayr and add a night to D&G. There is a lot to see in the area. I'd definitely visit Culzean on the way from Ayr to D&G. OR -- if you want ti 2 nights in Ayr, cut one night from Glasgow.